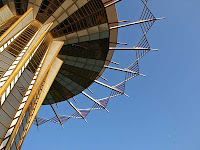 Love it or hate it, the architecture of Oral Roberts University is nothing if not unique. For years I've heard that ORU is the most visited tourist site in Tulsa. I have no idea if that factoid is true. But I do know from my own personal experience that out-of-state visitors often ask me to drive them past the futuristic campus on South Lewis. What happens when Tomorrowland runs headlong into cold, hard reality? I think that's exactly what's happening at Oral Roberts University lately. Recent work on the space-age complex has mostly involved improvements to infrastructure- widening a creek, improving drainage, building a bridge. But some of the so-called improvements are more destructive. 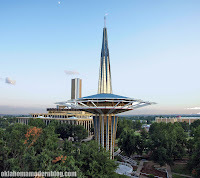 Until earlier this week the area around the base of ORU's famous Prayer Tower was a geometric plot of gardens and bubbling water fountains surrounded by tall trees. The garden was an integral feature of the futuristic complex, strategically situated below Tulsa's most unmistakable spire. As one passer-by reminisced, "I always thought this is what heaven would be like." But earthly finances appear to have disrupted Oral's vision of heaven on Earth. The recessed garden oasis is currently being mowed under and filled with dirt. Crews are moving in ornamental rock to hide the angular concrete, lava rock and that ubiquitous anodized aluminum. Presumably the maintenance of a complicated system of ornamental fountains require people and money that ORU has deemed unnecessary. It's apparent that maintaining the unique look and feel is not a high priority. ORU's space-age structures, designed by Tulsa architect Frank Wallace, have survived relatively intact for nearly 50 years. Today the campus maintains a kitsch appeal lost on most of the students who attend classes there. Hopefully it's not lost on the people who pay the bills.